Imagine that you've written a book that no one will publish; it's considered over-long and looney. 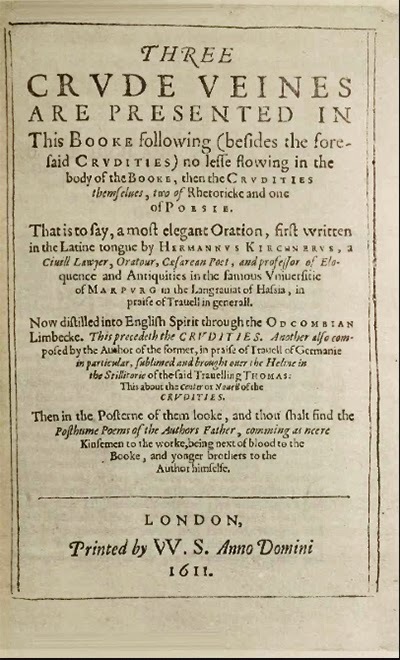 So, to pump-up its importance, impress, and tacitly solicit subscriptions, you ask eminent men, oh, around sixty of 'em, to contribute "panegyricke verses upon the Authour and his booke" extolling your wonderfulness and that of your volume. Amazingly, they do. But your contributors ridicule the book. You include their mockery, anyway. Some attention is better than none. You underwrite the cost of printing the book yourself and in doing so produce one of the great vanity publications ever issued, and if your contributors insult you, well, how flattering to your vanity that these great men took the time to do so. 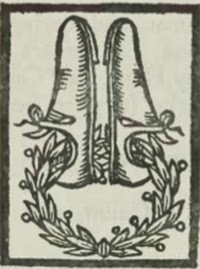 Such was the case of Thomas Coryat (1577-1617) and his book, Three crude veines are presented in this booke following (besides the foresaid Crudities): no less flowing in the body of the booke, then the Crudities themselues, two of rhetoricke and one of poesie…, popularly known by its title from the engraved titlepage/frontispiece (and subsequent editions) as Coryat's Crudities: Hastily gobled up in five moneths trauells in France, Sauoy, Italy, Rhetia com[m]only called the Grisons county, Heluetia alias Switzerland, some parts of high Germany, and the Netherlands. Newly Digested in the hungry aire of Odcombe in the County of Somerset, now dispersed to the nourishment of the traveling Members of the Kingdome. Within, Coryat records his step-by-step 1,975 mile schlep across Western Europe. He didn't intend for it to be funny, it just turned out that way. Outlandish, toilsome and wacky adventures are related with such sober and solemn seriousness that the clod is completely unaware that he is a clown in his own touring circus. And in Italic bathed himselfe in their syrrop. He rides them in France, and lies with them in Italie. You get the idea. It's an Elizabethan comedy roast but the roastee (known as the British Ulysseys, with accent on Odd-essy), basking in the attention, is deaf to the jokes. It's Mystery Science Theater 3000, the book edition, with eminent readers hurling written wisecracks at the deliriously ridiculous and over-long text while they peruse it from their reading chair, rather than vocally razzing a deliriously ridiculous and over-long movie from their seats in the theater. That none can study it to any end. Nor poorly limited with head or foote. Reason, and laugh, thy booke doth halfe make man. That thou on th' other halfe wouldst never touch. When wilt thou be at full, great Lunatique? Coryat apparently experienced this - and the other testimonials - as "Oooh, they like me, they really like me!" In short, Coryat was drunk during his entire stay in Turin. Complete copies of Coryat's Crudities are scarce. "Perfect copies with the plates intact are not common...The D.N.B. has repeated the statement that the Chetham copy is the only perfect one known" (Pforzheimer). A complete copy has, however, recently come into the marketplace. 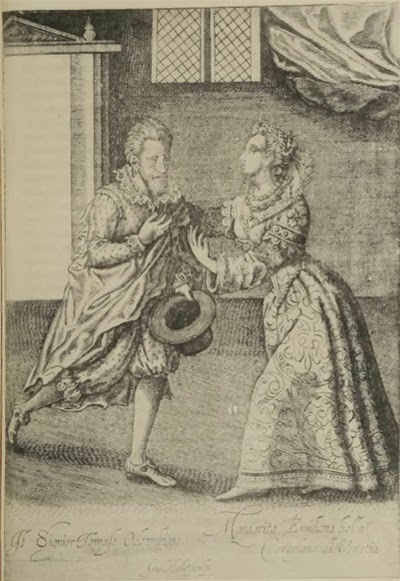 Offered by Whitmore Rare Books, the asking price is $25,000. Despite its faults it's one of the great travelogues. 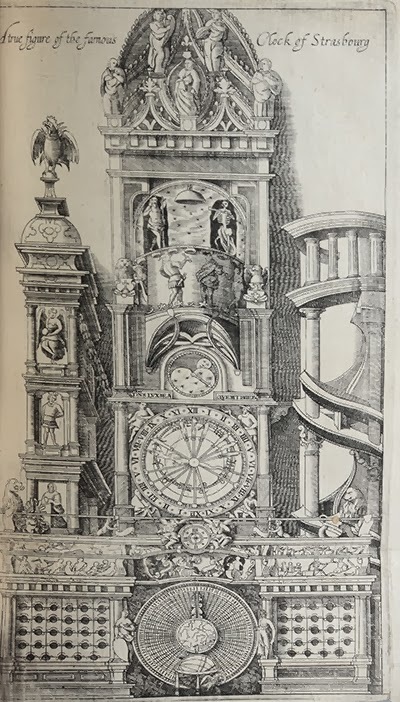 "Coryate drew on his experiences in writing Coryats Crudities (1611), which was intended to encourage courtiers and gallants to enrich their minds by continental travel. It contains illustrations, historical data, architectural descriptions, local customs, prices, exchange rates, and food and drink, but is too diffuse and bulky - there are 864 pages in the 1905 edition - to become a vade-mecum. To solicit ‘panegyric verses’ Coryate circulated copies of the title-page depicting his adventures and his portrait, which had been engraved by William Hole and which he considered a good likeness. About sixty contributors include many illustrious authors, not all in verse, some insulting, some pseudonymous" (DNB). I was imbarked at Dover, about tenne of the clocke in the morning, the fourteenth of May, being Saturday and Whitsun-eve, Anno 1608, and arrived in Calais (which Caesar calleth Ictius portus, a maritime towne of that of part Picardy, which is commonly called le pais reconquis; that is, the recovered Province, inhabited in former times by the ancient Morini) about five of the clocke in the afternoone, after I had varnished the exterior parts of the ship with the excrementall ebullitions of my tumultuous stomach, as desiring to satiate the gormandizing paunches of the hungry Haddocks (according as I have hieroglyphically expressed it in the front of my booke) with that wherewith I had superfluously stuffed my selfe at land, having made my rumbling belly their capacious aumbrie. - and everything he encountered, with the possible exception of dust motes. He then concludes his exhausting review of each city with a breezy, unintentionally amusing, "so much for Paris;" "so much for Venice;" "so much for Milan." It's so very much. Yea, verily and alas, the booke lacketh backgrounde musik by the eminent Elizabethan composer and performer, Boots Randolph, playing that olde English aire, Yaketie Saxe, to highlight its slapsticke gravitie and the inadvertent Keystone Cop qualitie of Coryat's adventures chasing after Europe, and enliven his dreary descriptions. CORYAT, Thomas. 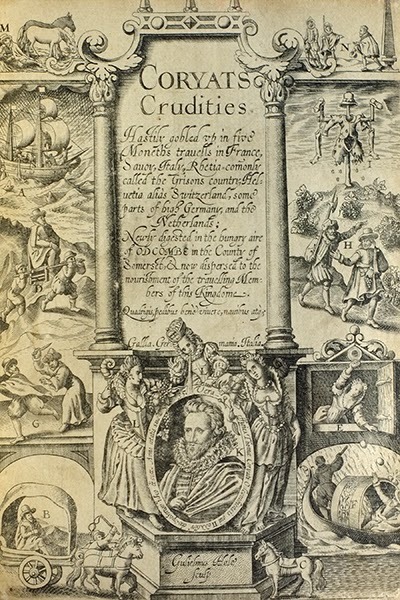 [From engraved title]: Coryats Crudities. Hastily gobled up in five moneths trauells in France, Sauoy, Italy, Rhetia com[m]only called the Grisons county, Heluetia alias Switzerland, some parts of high Germany, and the Netherlands. Newly Digested in the hungry aire of Odcombe in the County of Somerset, now dispersed to the nourishment of the traveling Members of the Kingdome. 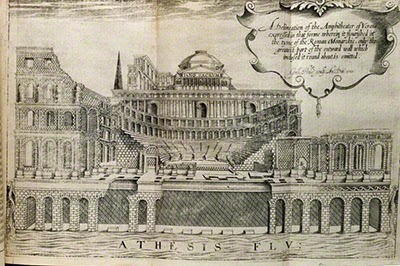 London: Printed by W[illiam]. S[tansby]., 1611. First edition. Quarto in eights (8 1/8 x 6 inches; 206 x 153 mm). [-]2; a8-b8 ([-]1 inserted after a3); b4; c8-g8; h4-l4; B8-D8 (D3 inserted after preceding D); E8-3C8; 3D4; [-]2 (first is signed 3E3; both are errata). Extra engraved titlepage (i.e. frontispiece) by William Hole, five engraved plates (three folding), two text engravings and numerous woodcut initials and head-pieces. With two leaves of errata. Pforzheimer 218. Cox 98. Keynes 70. Images courtesy of Whitmore Rare Books, currently offering this volume, with our thanks.